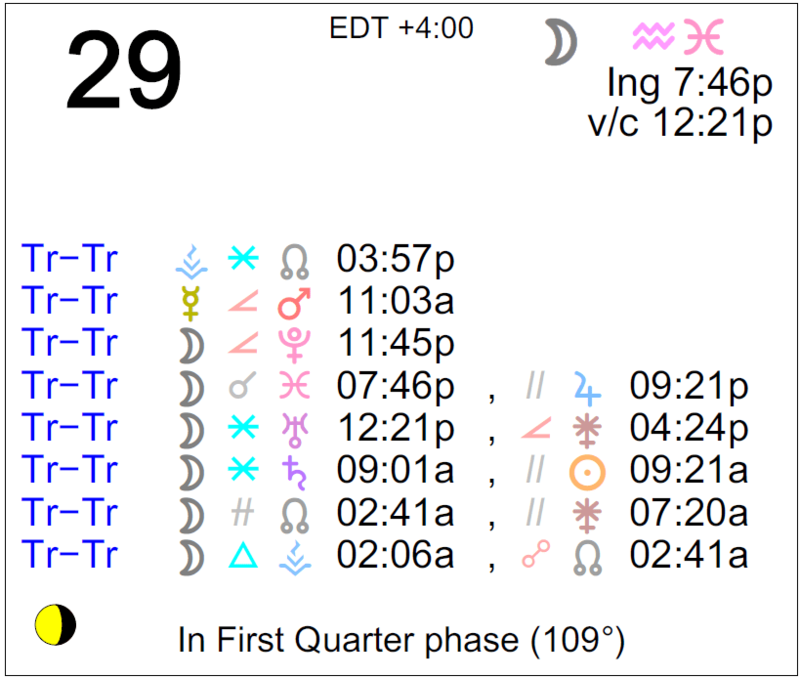 The Moon is in Aquarius until 7:46 PM, after which the Moon is in Pisces. The Moon is void from 12:21 PM to 7:46 PM. 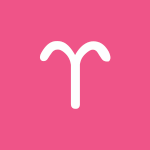 Others, especially a partner or close friend, can be difficult to please early today, but try not to let their irritability faze you, dear Aries. It’s likely they’re too wrapped up in their issues, and it’s not a symptom of something bigger. As much as you might want to bring up a particular topic, it may be premature to do so. Watch for too-quick criticisms and conclusions or being overly clinical in situations that require more tact or thoughtfulness. Mental activity is intense, making it easy to get into arguments, but it can also be a good time for tackling a complicated problem or for avidly pursuing a mental interest. Later today, you’re in a gentler mood, and the Moon’s move into your privacy sector brings on an urge to decompress and rest. 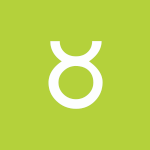 Good energy is with you for productivity, dear Taurus, although you may need to combat some impatience. In the first half of the day, you might be feeling as if others are too pushy or aggressive with you. Major decisions should probably be avoided now since it’s difficult to discern between whim and true desire. However, this can be a strong time for mental energy, so selecting activities that require a tough mind makes sense now. Later today, you might seek comfort from peers or people who don’t hold expectations of you. Life is more easygoing as the day advances. In the first half of the day, with Mars in minor challenging aspect to the planet of communication, your ruler, you could be both edgy and on edge, dear Gemini. Be careful not to criticize someone in the process of trying to sort things out. Impatience is the downfall of this combo, but the tension it creates can be used to charge through something that needs your attention, which can work in your favor. A tough mind can come in handy at times! The Moon moves to the top of your solar chart this evening, making it easy and natural to tap into your ambitions. This morning, there can be a lot to think about, dear Cancer, to the point that you may have a hard time turning your thoughts off long enough to relax! Or, the atmosphere around you is so chaotic that you can’t hear yourself think. Impatience can lead to disagreements or irritability. There can be a combative energy that is better applied to work than it is to relationships. Use mental tension to plow through something that requires a thick skin. Avoid rushing things that need special handling. 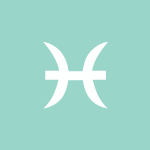 Later today, the Moon’s move into a companion sign (Pisces) can improve your mood considerably. This transit begins a couple of days of more focus on fun and self-expression. 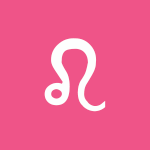 The day holds good energy for work and motivation, dear Leo, but impatience should be avoided for best results. Pressure builds today but clarity increases. Watch your temper and avoid pushing something that you shouldn’t or can’t change, allowing for unexpected changes that are out of your control. Arguments can happen suddenly with Mercury and Mars in hard aspect. The Moon’s movement into your solar eighth house this evening brings a stronger need for strategy in your life. This is a brief transit, but it’s a good time for observing more than jumping in and doing. 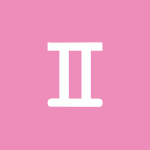 Tensions are likely in the first half of the day, Virgo, particularly if you are relying on schedules to go as planned or if you are rushing things. There can be some pressures now, and some time alone may be in order if it can be managed, just so you can hear yourself think! Even so, it can be difficult to stop thinking once you get going. 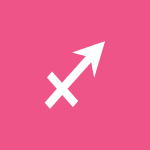 Either way, Mercury in an awkward aspect with Mars points to some mental agitation, but it can also serve as a boost to handle a matter that you’ve been avoiding. It’s a good time to tackle a project or problem. 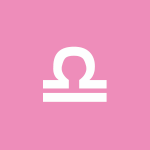 This evening, the quick-moving Moon enters your partnership sector and your powers of negotiation rise, as long as you don’t jump too quickly to conclusions. Complicated feelings can quickly bubble up to the surface today, seemingly out of nowhere, Libra. It doesn’t take much to trigger frustration this morning. Anger or resentment that you have buried or brushed to the side can emerge now in unexpected ways, and while the feelings can be confusing at first and you should absolutely deal with them, do not let them control your behavior. Avoid rushing things, particularly business and finance related endeavors. However, mental tension can be used to your advantage if you become determined to take care of a matter that’s been hanging around too long! 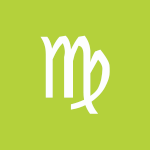 A Mercury-Mars aspect influences the first half of the day and can stir up some tension, dear Scorpio. The probability of something burning out nearly as quickly as it starts runs high. Both physically and mentally, try not to over-exert yourself. Additionally, it’s best to avoid speaking too soon or ahead of yourself, which are possible with Mercury in your sign and Mars in the sign behind yours forming a problematic aspect with one another. Speaking prematurely about your plans may not be wise right now. As the day progresses, tensions subside considerably. The Moon enters a companion sign (Pisces) and your pleasure sector this evening, and it becomes easy to find creative ways to express and enjoy yourself. A Mercury-Mars challenge this morning can lead to impatience or disagreements, dear Sagittarius, but it can also serve as a push to handle a problem. Friends can be unreliable, or distractions get in the way of work or business. The trick is to avoid activities that require patience or attention to detail, as anything too ordinary or mundane will only serve to frustrate. Extra energy seems available on a mental level, and this is best applied to something productive. Otherwise, there could be tense interactions or an overactive mind that never seems to let you rest! The Moon moves to the bottom of your solar chart this evening, and life calms down considerably. 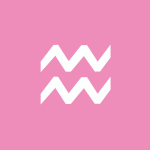 Impatience or brusqueness are possible challenges with a Mercury-Mars aspect in effect this morning, dear Capricorn, but if you channel the extra mental energy well, you can make excellent progress on a project, or you can motivate yourself to handle a nagging problem. Sometimes getting to the point of being fed up can be just what you need, but it’s probably wise to sidestep needless arguments as this influence can be very tense. Speaking too soon in public or professional settings should also be avoided now. The day progresses with far more patience, and the Moon’s move into harmony with your sign this evening helps your comfort levels as well. 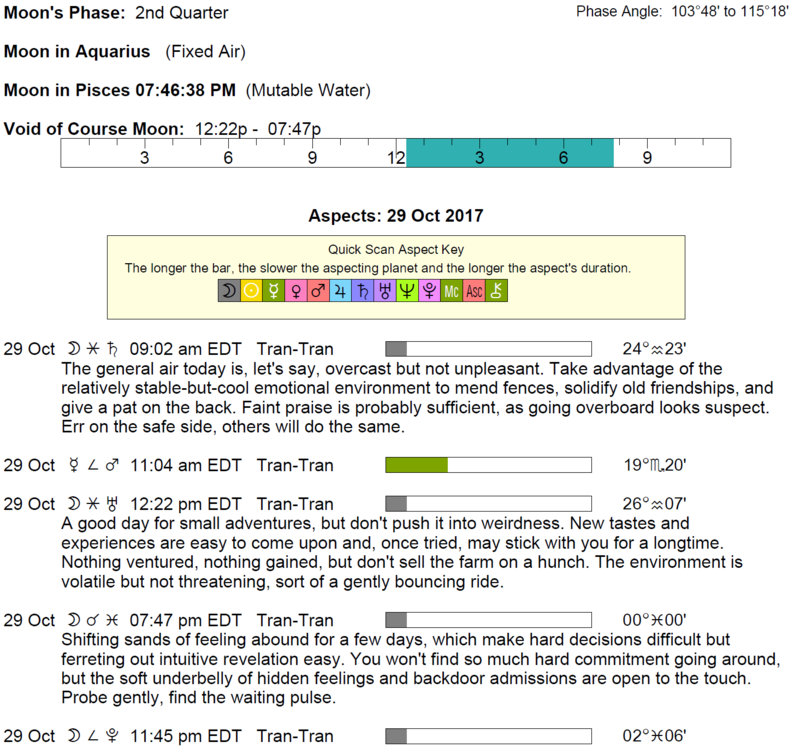 Desires come on intensely and the need for immediate results can either work for or against you in the first half of the day, Aquarius. 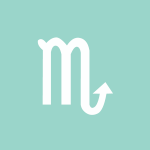 Ideally, a Mercury-Mars aspect active now motivates you to put an irritating problem behind you. Otherwise, you could find your mind races or arguments that lead nowhere ensue. Because Mercury is at the top of your solar chart, your words seem to have more impact and even permanence these days, so don’t jump to use them. 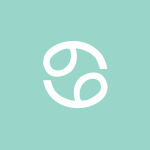 The Moon in your sign until this evening connects you powerfully to the world around you, after which you take more interest in manifesting and practical applications than making emotional connections. Impatience may be a problem in the first half of the day, dear Pisces. The pace can be a little chaotic, especially if you are trying to push something forward that needs more time to develop naturally. A significant other may be irritable, or you are trying to rush a conversation that requires more thoughtfulness. Use tension to your favor by allowing it to motivate you to take care of business, but don’t fall into an impulsive frame of mind. The Moon entering your sign this evening can bring your emotions bubbling up to the surface, and it can also stimulate a stronger need to feel emotionally awake and connected through your experiences. Emotions rise but tensions release. 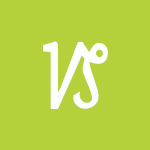 If Your Birthday is October 29th, If Today is Your Birthday full horoscope here. We are thinking about the long view, seeking out security and stability rather than change. We may be committed, focused, resistant to making changes, and stubborn. We are more able to find a balance between our own emotional needs and our responsibilities. We are more tolerant, deliberate, and resolute. We could be experimenting with new ideas or feelings. There can be chance meetings, events that occur that open our hearts or our emotional awareness. Sabian Symbol: A gang of robbers in hiding. Perception of value is skewed by fear or desire. There can be envy, jealousy, and manipulation now. Issues of over-attachment can arise. There can be difficulties controlling desires in relationships. Sabian Symbol: A child giving birds a drink at a fountain. Sabian Symbol: A bridge being built across a gorge. Sun 02° Taurus 53' 34"
Moon 22° Sagittarius 08' 53"
Mercury 08° Aries 03' 32"
Venus 03° Aries 13' 29"
Mars 15° Gemini 11' 06"